Dating: It is like an introduction to this great album. The main theme of this song is also the main theme of first three songs. The entrance is made by the bass then it is accompanied by the piano. After that, we hear a minimalist percussion that is developed in time. The piano improvises the main theme. The initial melody is played back and continuously linked to the next piece. Picnic: The piece starts like the same theme with the first piece but with a faster and more hopeful tempo. The melody is just like a picnic. The dialogue between drum/percussion and bass is used for improvisation. The end of the piece is again linked to the next piece. I think these linked pieces are partitions of E.S.T. 's one single performance. The Chapel: A great entrance following the previous piece's melody is made by the piano. We hear strange and interesting sounds coming from the drums. Bass only gives the basic notes with a smooth and melodic tone. The piece's main theme is very dramatic as if it is explaining an old but forgotten place. Dodge The Dodo: The triplet ends just before the fourth piece and a very energetic piece starts a new series. A very aggressive drum rhythm accompanies a soft double-bass and offensive piano. The double bass is sometimes played by bow and passed through distortion. The piano is usually touched from inside. Dan Berglund improvises the main theme by his bow at the middle without the piano. Esbjörn's touches to the piano signals the ending of the first act of improvisation then with the increase in tension in the piano we again hear the same melody in the entrance. The trio's sound gets crowded through the end by means of drum and bass. Going to the end we hear a transistor radio sound which links the first part of the series to the second. From Gagarin's Point of View: We feel like watching a space movie with the transistor radio sound coming from the previous piece and the cool drum and bass rhythm in this song. The piano, bass and drum are calm. After the end of the first 2 minutes we start to hear electronics much more. This is literally a great composition and a must listen of the album. The transistor radio in the beginning makes the last partition. The Return of Mohammed: This piece has a link with the Mohammed Goes to Newyork pieces in the album When Everyone Has Gone, 1993. Cornette: The short entrance is made by introducing the main theme very fast. This is almost a main stream jazz piece. The improvisation is directed by the piano. You will not believe the speed of Esbjörn Svensson. He sometimes touches to the inside of the piano during this fast partitions. Dan Berglund experiments on the double-bass creating interesting sounds. In the Face of Day: A melancholic melody is played by the piano first. We hear a small piece of the same theme once again from double-bass. There is a little rise in the tension near to the end of the first half triggered by Esbjörn, but it stops with percussion of Magnus Öström. The members carry a soft melody just after that. The touches of Esbjörn to the piano are as soft as silk. Magnus Öström prefers using brushes in such performances with small movements. Dan Berglund takes the role as the main theme. The tension is tried to be increased from time to time but the softness is certain throughout the piece. Subway: A double-bass played with a bow makes the introduction by a very dramatic theme. The piano is on the background with cold notes. Magnus Öström's percussion is processed. It seems that Dan Berglund uses a little effect for his bass. 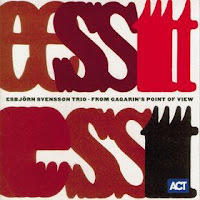 Esbjörn creates really interesting notes from the piano consistent with his accompaniments. The Definition of a Dog: Detached from the previous melody, this is an energetic and fast jazz piece. The piano has been improvising almost during the whole song. We hear the main theme while they are giving breaks. Besides, all members are in a good synchronization. The last minutes belong mostly to the drum and bass which is deeply accompanied by piano. Magnus Öström's performance here is just perfect. This piece became later one of the favorites of the trio in live performances. Southwest Loner: The end is begun by a long piano partition which is later accompanied by just brushes touching to the drum-set. Dan Berglund is heard at the last minute with only main notes. I love such endings.